Get to know the frog! Are you in need of frog activities for preschoolers? Crafts and lesson plans embracing the amphibian theme are plentiful, and kids never seem to lose interest in the unique and bouncy charm of the humble frog. Whether you opt for a hands on experience with a live frog or choose to explore the world of frogs through books and learning materials, these activities for preschoolers are sure to please every tot! Children love to learn about the outside world and the daily happenings in nature. If you want to introduce small children to the world of frogs, these frog activities for preschoolers are creative and exciting for kids and adults alike. Games: Frog games can be interactive or action packed. A classic game of Leap Frog is a great way to get children moving while emulating the classic hop of a frog. To play, simply line children up and let them hop about and ribbit at the same time! Activity: Creating frog preschool activity crafts such as pop-up cards, paper bag puppets, and jumping frogs is a great way to incorporate a frog theme into rainy day fun, all while increasing dexterity skill levels. Check out Enchanted Learning for a wonderful selection of free frog craft ideas! Books: Rather than just center frog exploration on crafts and activities, introduce kids to the science of frogs through encyclopedias and science books. Matching games: If you have science books with a large variety of frog species and their photos, why not make two color copies of each frog and play a quick game of match or memory? This simple card game is easy to travel with and helps kids build their memory and problem solving skills. To create a sturdier set of cards, affix each colored frog copy (cut to size) on a cardboard backing. Body movement songs: Body movement jingles and songs are always a sure hit with preschoolers. Not only do body movement songs raise body awareness and coordination, they help exercise children's memory and instill a sense of union between the group. For plenty of silly and fun frog songs, check out Preschool Rainbow. Printables: Printables are the perfect solution for restaurants, doctor appointments and long trips where kids need portable entertainment to keep busy! Teacher and school supply stores are chock-full of learning books and activities for travel. For a wide selection of free frog printables, including mazes, coloring pages and puzzles, visit Print Activities. Pet shop: The pet shop is the perfect place to visit if you want to explore the live world of frogs. Not only is admission free, there is a wide selection of aquariums and insects that help teach children how to create a natural like habitat for frogs indoors. Field trips: For those wishing to make a field day out of frog exploration, why not contact your local zoo and see if they have a tour guide available for an amphibian adventure? While not every zoo has an abundance of frog species, many have a reptile exhibit with plenty of learning materials on hand. The San Diego Zoo is a popular amphibian enthusiast destination, known for their Reptile House. 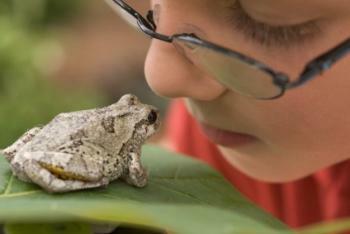 Hunting for frogs is a fun family or school experience that can turn an ordinary walk into an action packed adventure! For the best odds of finding a frog during an outdoor excursion, go late and go near the water! Frogs have red eyes that will glow in bright light, so bring a flashlight and see if you can track down a frog croaking near the water's edge! As always, make sure children are well tended and supervised at all times near the water. Frog activities for preschoolers are a great way to introduce the world of amphibians to young hands and minds. If you're up for a world filled with hoppity fun, go ahead and explore these activities with your children, as you're bound to learn a few new facts about this amazing creature yourself!